Reserve free tickets at the Visitor Center or call (435)688-3200 to reserve one of the 80 seats per session. For the more information, click here. Learn how to research, design, and create interpretative exhibits and activities in your own museum! entire series and complete a small exhibit project at their own museum. Workshops will be held in St. George and Leeds on 2/6/2017, 3/6/2017, 4/3/2017, 5/1/2017, and 6/5/2017. Training and materials are free, but workshop space is limited and by competitive application. For details and an application form, click here. (approximately 1000 East and 300 South in St. George). For a map of the campus, click here. Free to the public. Membership dues $25 single, $30 couple. 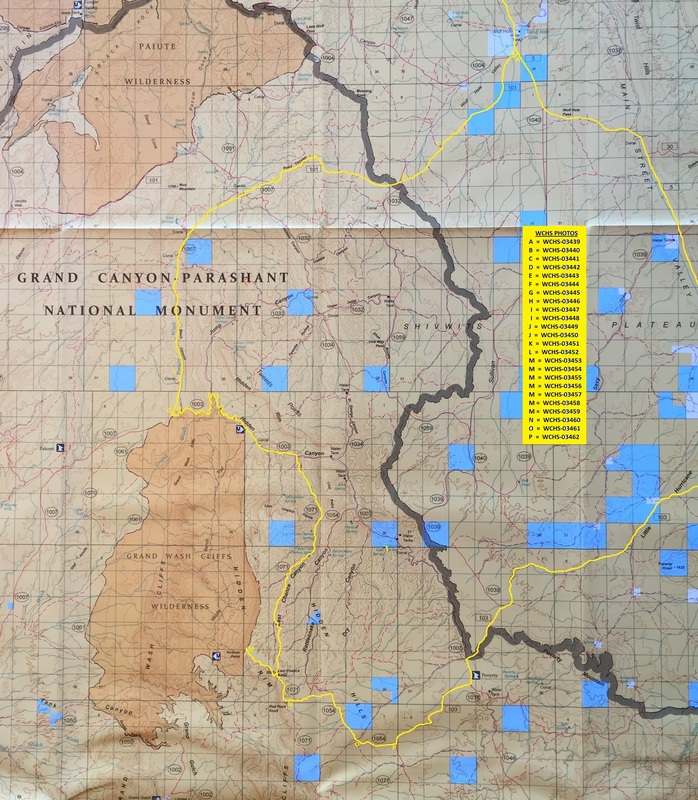 https://www.facebook.com/DixieArchaeologySociety1, or call Chris Oravec at (435)986-8348.
lands managed by the Bureau of Land Management. A meet & greet will start at 5:30. A catered dinner ($14) will begin at 6:00. Meet at the Washington City Community Center, 350 N Community Center Drive, Washington. the meeting will be held in the historic Washington City Museum. There will be guided tours, refreshments, and entertainment. Dixie Encampment Chapter will be conducted. Light refreshments will be served. Please arrive by 6:50 at the residence of Wayne & Gae Pace, 477 West Rolling Hills Drive, St. George. membership category of your choice. Strip area between the Grand Canyon and southern Utah. A Ground Up Look at Utah 75 Million Years Ago". or contact Zion Natural History Association at (435)772-3264. The sites visited will include man made historical structures including the pioneer dams on the virgin river. Also pre-historic native sites that were discovered during the building of the south airport road. Also geological sites of interest. This is mainly a driving with stops field trip with little hiking but a lot of information of interest. 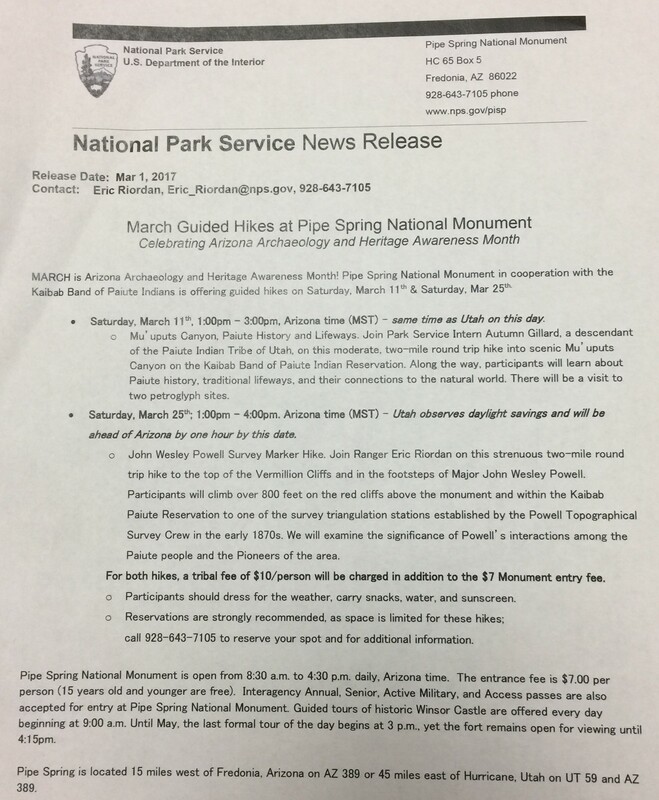 Meet at the Public Lands Information Center (BLM) parking lot at 10:00 am to form carpools. For the news release, click here. Thursday, 1/26/2017, 9:00 am - ??? by a local cattle buyer, Fred Levanger. Later, Fred sold the barn to a man from Delta named Knight. 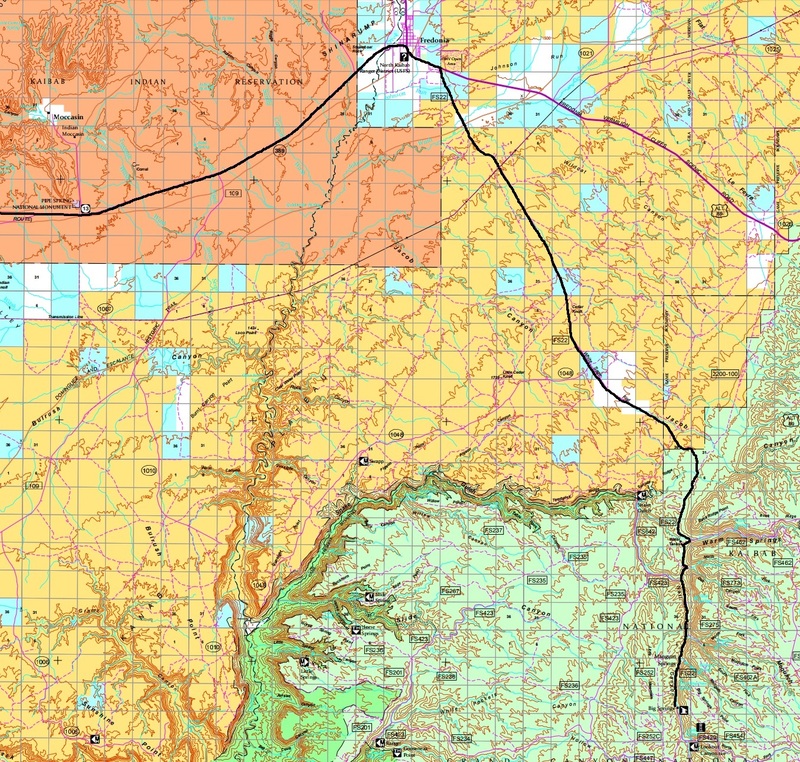 people of Southern Utah, Northern Arizona, and Southeast Nevada. Make reservations at the Public Lands Information Center or call (435)688-3200.
and each just pay for our own meals. For the more information, click here and read the notices at the end. typical day, as well as the greatest challenges facing those charged with protecting public lands. Craig Childs will present "The Other Side of the World: An evening of ancient stories, the Ice Age,". and other events of the Americas". "Preserving the Paragonah Fremont Site: A Model Public / Private Partnership." heritage and advancing educational outreach. Dr. Stephen Rowland (Professor of Geology at UNLV) will speak on "Fossil Tracks in Gold Butte"
significance. This discovery was made by local geology expert, Tom Cluff. At the Mesquite Community Theater, 150 N Yucca St, Mesquite NV. Open to the public and free (donations are accepted and appreciated). in the twisted and contorted appearance of this unique area. and objectivity in contrast to the biased histories that were long so common. Council (NAC) at Dixie State University. He was valedictorian at Dixie College c. 1967.
amazing area. Lee Kirk, Acting Monument Manager, is also invited to attend and answer questions. Are you interested in genealogy? Would you like to learn how to research your family history? There is a sign-up sheet at the upstairs reference desk. Space is limited, so reserve your place now. For the flyer, click here. filleted the earth open to create the amazing beauty we observe in Snow Canyon. At the Ivins City Hall, 55 North Main in Ivins. This class is free, but registration is required. For details, click here. 1,000 miners in the early 1900's. National Geographic has called Vermilion Cliffs National Monument a "little-known wonder." slot canyons in the world (Buckskin Gulch), and is the home of a California Condor roosting site. Come hear from monument staff what is in store for monument resource management. Building (Room 332). 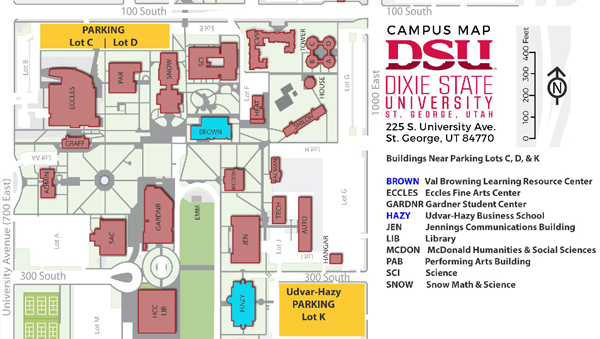 For a campus map, click here. Parking permits are not required on Saturday. language plays in protecting and celebrating the living earth. This program is sponsored by the Silver Reef Museum and will be held at the old Cosmopolitan Restaurant. The cost is $6.00. For the media release, click here. This session is fully subscribed, but the program will be repeated on 4/8/2017. For more information, contact the Museum at Museum@SilverReef.org or call (435)879-2254. "The Archaeology of Native American Flutes in the Southwest." flutes to historical use of flutes in Puebloan native cultures. click here. Some walking is required, so get there early. thousands of paleontological discoveries over more than three decades. and other Vertebrate Tracks from Lake Powell, Utah". In Room 128 of the Snow Building at Dixie State University. 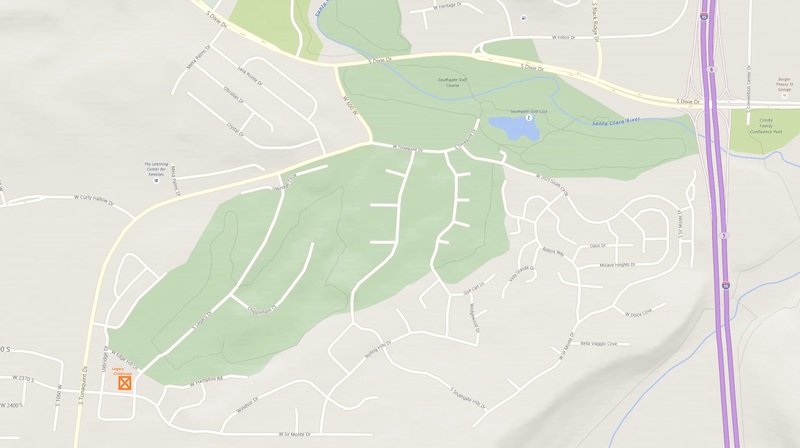 For a map of the campus, click here. This lecture is free and the public is invited. that he will tell us about. This lecture is free and everyone is invited. For information, contact Kelly Paxman at kpaxman@skyviewmail.com or (435)680-1407. Dr. Tara Smiley will present "Why is the Great Basin so Diverse? A Paleontological perspective". describe the history and opportunities to explore this wonderland of sand. and have a chance to play home-made instruments. The museum is open to the public and everyone is invited. For the more information, contact Susannah Nilsson at susannah_nilsson@yahoo.com. to establish agriculture in an extreme, remote desert are still visible in the landscape today. This trip will require high-clearance 4WD vehicles. Carpools will be encouraged. and Christmas at the Homestead. Ryan Paul, Museum Curator, will describe this unique urban park. This program is sponsored jointly by the Silver Reef Museum and the Dinosaur Discovery Site Museum. It will be held at the old Cosmopolitan Restaurant in Silver Reef. The cost is $4.00. Reservations can be made at http://tinyurl.com/03-25-17 or by calling the Museum. For the media release, click here and for the flyer, click here. John Wesley Powell Survey Marker Hike. Large draft horsed were a key factor in pursing agriculture during settlement of the American West. (OSTA). Dr. Lyman continues to research, write, and is a popular lecturer. A demonstration of egg dyeing the traditional Swiss way. 3036 W. Santa Clara Drive in Santa Clara. This demonstration is free and open to the public. For a photo of some eggs dyed in this way, click here. information on this, click here. Lectures are free to the public, but you are encouraged to become a member. Dues $25 single, $30 couple. a focus on protecting rock art - and less paperwork. following the Virgin River through the Virgin River Gorge. Meet at the Paiute Convenience Store not far east of the reservation residence area on Old Highway 91. For more information, contact Dr. E. Leo Lyman at lionman011@gmail.com. - Come help make a quilt in 2 hours that will be donated to charity. - See various quilts on display. - Learn stories of the pioneer quilts. This event is free and the public is invited. For the flyer, click here. For other information, see https://www.dupstgeorge.org/home.html or call the Museum at (435)628-7274.
demonstrations. Each child will receive a feather. Ths event is free and open to the public. At the Santa Clara Arboretum located at 1600 Lava Cove Dr, Santa Clara. This program is sponsored by the Santa Clara Historical Museum. Cotton Mission in Southern Utah. It should prove to be very interesting and informative. by a reception and book signing. It will be held at the old Cosmopolitan Restaurant in Silver Reef. Lynne Clark will give a photo presentation on the subject of Agriculture in Washington County. This program is sponsored by the Silver Reef Museum. Cotton Fest in the Park, Car Show, Tractor Pull, Historical Society Fireside, and Swim Party. of the Dixie National Forest." Meet at the Public Lands Information Center, 345 E Riverside Drive in St, George. experience in fragile desert areas of the Colorado Plateau and "specializes" in the Arizona Strip. He will be describing some of his favorite places around that vast area. For more information, see http://utahpaleo.org/annual-meetings.html. Historian, will meet us there at around 10 am and lead us on a walking tour of the town. and the cattle industry in Southern Utah. In the gymnasium at the Washington City Museum, 25 E. Telegraph Road in Washington. Free. Everyone is welcome to attend. Casual dress. For more information, call (435)673-3085. Self-guided tour of the Orson Adams House. tunnels (tunnels restrict vehicle size to less than 12 feet in height and width) and turn left. Follow the road around to the Adams House which will be on the right. For more information, contact Lori Hunsaker at lhunsaker@blm.gov. and petroglyphs found in the Santa Clara river reserve along the Anasazi ridge trail. At the Santa Clara Branch of the Washington County Library, 1099 N. Lava Flow Drive in Santa Clara. For more information, contact Susannah Nilsson at susannah_nilsson@yahoo.com. group explores to answer questions. Meet at the Anasazi Trailhead, Santa Clara River Reserve, Santa Clara. For more information, contact Susan Crook at susan@conserveswu.org or call (435)773-7920.
of the Utah Rock Art Research Assoc. The Shaman's Gallery is a wall of pictographic images found on the north side of the Grand Canyon. to honor the ancestors; to identify sacred landscapes and so on). and significances from these remarkably beautiful figures. integrity of potentially historic resources that may appear to be merely trash. of Arizona and long directed by William Rathje. Location: Rusty Cliffs Trail (Meet at Chuckwalla Trailhead). 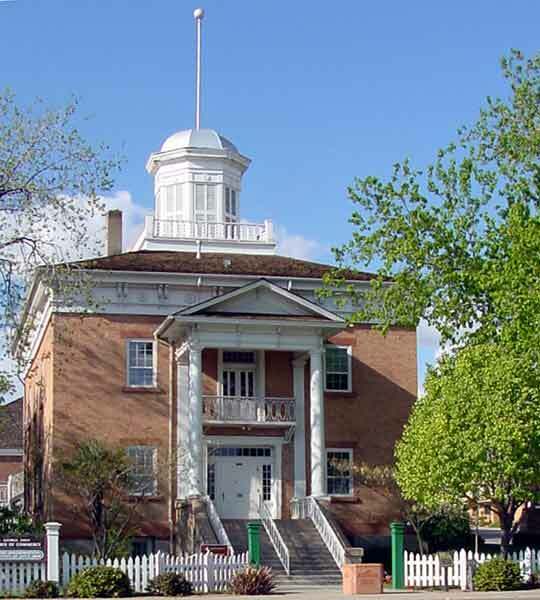 Washington County Courthouse, and the Woodward School were quarried from? R. Wayne Pace, Ph.D.
For more information, see the flyer or call Ruth L. Tanner at (435)634-5737 ext. 2284. The informational program will be, "Why Would I Like To Join The SUP?". There will be an optional light dinner catered by Magelby's ($10-15 per person). At the Crystal Inn Hotel & Suites, 1450 S. Hilton Dr. in St. George. Anyone with an interest is invited to attend. Please RSVP to Dave Peterson at (435)554-5618 by May 15. For more information, click here for the invitation. the early days in Veyo too. Paul Bogard will present "The End of Night". For more information, see the flyer. Pioneer Food - Where Did the Early Pioneers Get Their Food? This event is free and the public is invited. or call the Museum at (435)628-7274.
and the Utah Division of State History. Megan van Frank at Utah Humanities: vanfrank@utahhumanities.org or (801)359-9670.
and first bishop of the Diocese of Salt Lake. Washington County Historical Society, and Silver Reef Museum. included a rock bunkhouse and a rock cookhouse. Mining continued until 1918. This trip will require high clearance vehicles with proper equipment for rough roads. For more information, click here and read the notices at the end. For a report on this trip, click here. sometimes painful. It also demonstrates contested history that goes beyond what happened and why. It will be held at the old Cosmopolitan Restaurant in Silver Reef. The cost is $4.00 per person. Please call or regiser online at https://form.jotform.com/71295429233963. or call the Museum at (435)879-2254.
author of the new book, Sunlight and Shadow, The Page Ranch Story. barn. This is a great chance to meet relatives, talk about history, and check out the new book. All are welcome. This is the first tour of the season - more to come later in the summer. 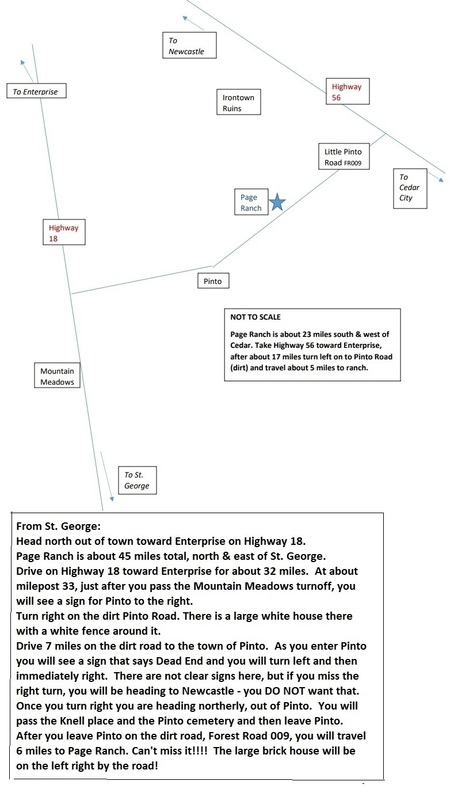 For a map of how to get to the Page Ranch, click here. If you need more information, contact Lisa Michele Church at lmhchurch@gmail.com. For Historic St. George Live! (June-August), click here. "Incised Stones and Unsecured Localities: Authenticating Private Collections" by Tim Riley Ph.D.
for American Archaeology 79th Annual Meeting, April 23-27, 2014, Austin, TX. on the Shivwits Plateau in the upper canyon give way to Joshua trees in the desert country below. 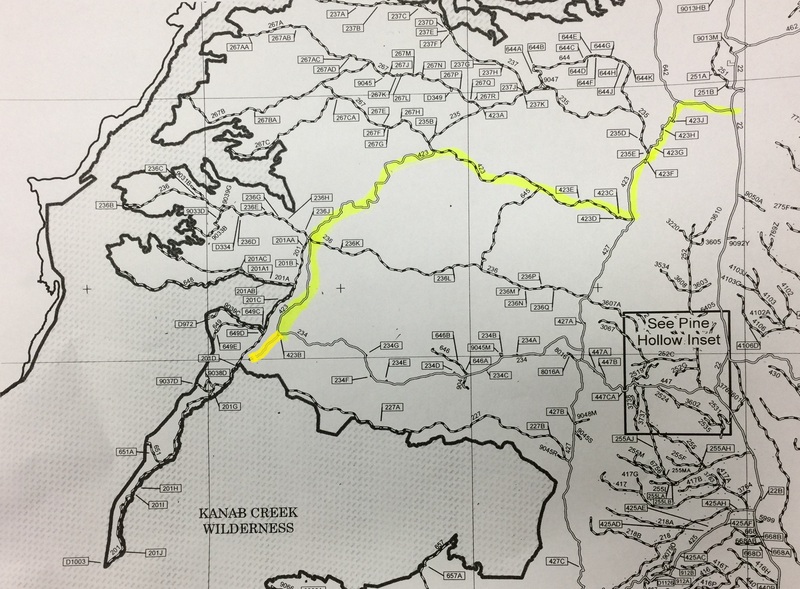 For a report on this trip, click here and for the trip map, click here. Paula Mitchell (Special Collections Librarian at SUU). Saturday, 7/1/2017, 10:00 am - ??? There will be a pot luck lunch, some home style entertainment, and all the latest family news. This will be a good chance to meet or get caught up with other family members and should be fun for all. At the New Harmony LDS Chapel, Cultural Hall. contact Lenny Brinkerhoff (family association VP) at lenny@infowest.com or (435)635-4379. 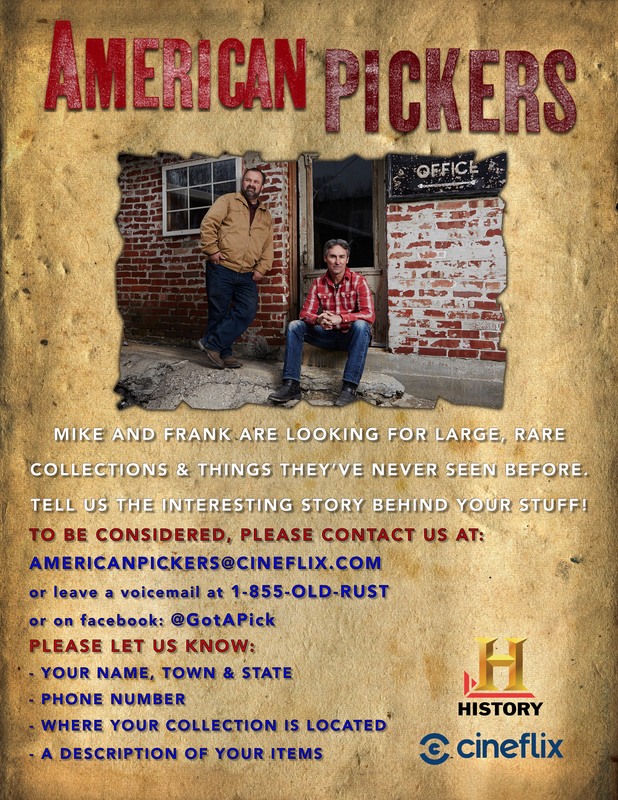 The TV show, "American Pickers", will be filming in Utah during July 2017. See the press release and a general flyer. Episodes generally air 3-4 months after filming. of Zion National Park 1700-1930". amphitheater known as Hells Hole. The area provides habitat for deer, turkey, and Kaibab squirrels. Lecture: "Silver in Sandstone - The Geologic History of Silver Reef, UT"
of other features which were created from the same event in earth history. and will be held at the Electric Theater, 68 E. Tabernacle in St. George. This event is free but registration is appreciated. Sign up at http://tinyurl.com/WashingtonCountyWorks. flank of Mt. Trumbull, a reliable water source holds much of the human history found on this plateau. the pool on the lava wall, a white cross has been painted onto the surface. Dr. Joseph Platt will present "Raptors in Zion Canyon". Lecture: "History of Healthcare in Southern Utah"
by Terri Kane, Southwest Region of IHC Vice President and CEO of Dixie Regional Medical Center. This presentation will cover healthcare in southern Utah, past, present, and future. This event is free with registration. Sign up at http://tinyurl.com/WashingtonCountyWorks. For more information, click here or call (435)216-2651.
changes in economy, ethnology, and technology will be discussed. At the Ivins City Park, 100 N. Main St. in Ivins. Will be held in St. George and at the Mountain Meadows Massacre site. 11:30 am Siege Site - A box lunch will be provided at $10/person. Fiddlers will provide music. from the Pioneers until now. and will be held at the Dixie Academy. examples of West Coast indigenous art. Will be held in Centerville, Utah. For more information, call the bookstore at (435)652-7644.
tribal development and new beginnings together-the challenge of tribal governance in the 21st century. There there several admission price options. At the Dixie Center, 1835 S. Convention Center Drive in St. George. At the Deseret Book Store, 735 S. Bluff St. in St. George, (435)628-4495. Hosted by the the Silver Reef Museum at the Cosmopolitan (next to the Museum). other events that will be held in partnership with this exhibit. For a brochure about the exhibits statewide, click here. For a brochure about supporting the exhibit in Silver Reef, click here. For a brochure about the exhibits in Washington County, click here. For a list of related events, click here. Guest speaker will be Laura Frei who will be speaking about pioneer clothing. She has also put together some very interesting pioneer stories that she will share. face-to-face, and to propose solutions to issues that divide us. Kenneth N. Gardner Student Center Ballroom, Dixie State University, For a map, click here. For more information and contacts, click here. in conjunction with the Santa Clara City Swiss Days Event. 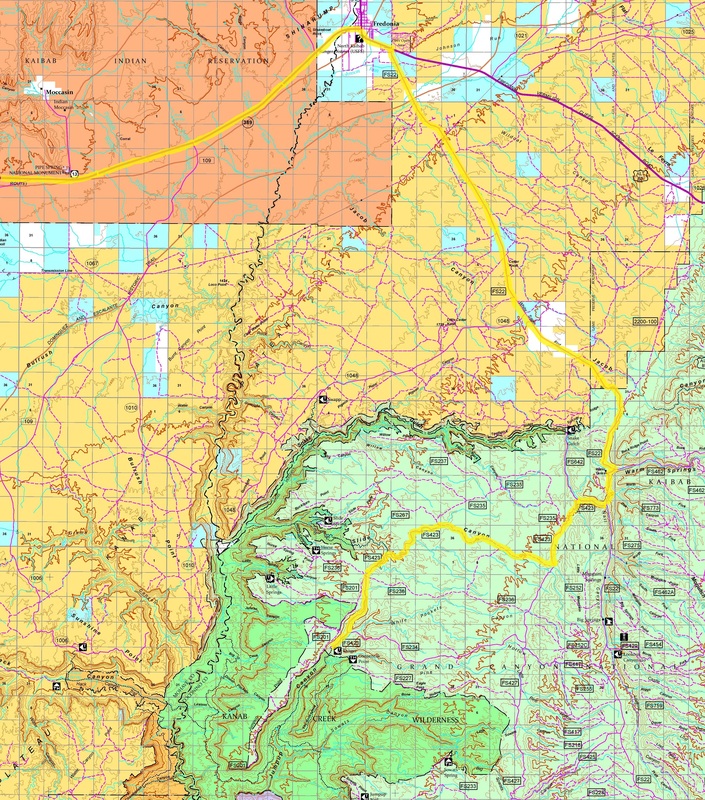 1099 N. Lava Flow Drive, St. George UT 84770.
the Marble Canyon portion of Grand Canyon National Park. and promoting the National Parks throughout the past 150 years. it is such an important part of the community. creation of the County's water works. Theme: "Local Matters: Interweaving Historical Threads of Community"
titled "The Page Ranch Story: Preserving a Local Treasure". The conference will be held at several venues in the Salt Lake area. go to the conference website, https://heritage.utah.gov/history/2017conference. Brian Passey, Outdoor Guide and Writer, will present: "I Was Here." but will also speak to what we feel about those locations today. single men, many of their projects fulfilled the needs of the communities they served. their community's most precious resource, the irrigation water for their fields. Leeds Town Hall, 218 N. Main Street in Leeds. This event is free but registration is suggested. Sign up at http://www.ArtstoZion.org. have changed to policies that promote Indian self-determination. from Pioneer days until now. and will be held at the Eccles Fine Arts Building on the Dixie State University campus. rich heritage in prehistoric records. 86 S. Main Street in St. George. This is a drop-in family art activity with the Utah Museum of Fine Arts and Dixie Watercolor Society. and will be held at the Silver Reef Museum, 1903 Wells Fargo Road in Silver Reef. prove to be an entertaining evening! describing programs to protect and interpret these important sites. Dr. Christopher Norment will present "Great Basin Habitat Islands: Mountains and Metaphor". Washington County over the past 150 years. 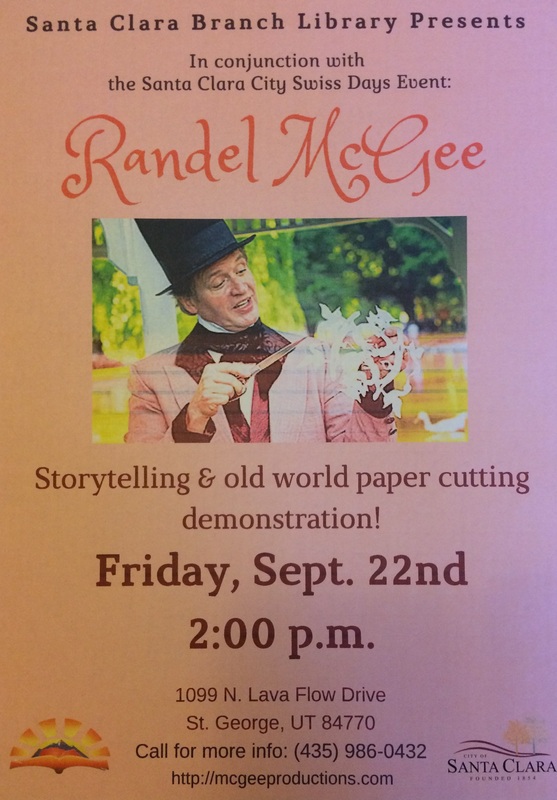 will demonstrate different ways to make rag rugs. common and why they were the guns of the Old West. The Leeds event is free but registration is suggested. Sign up at http://www.ArtstoZion.org. 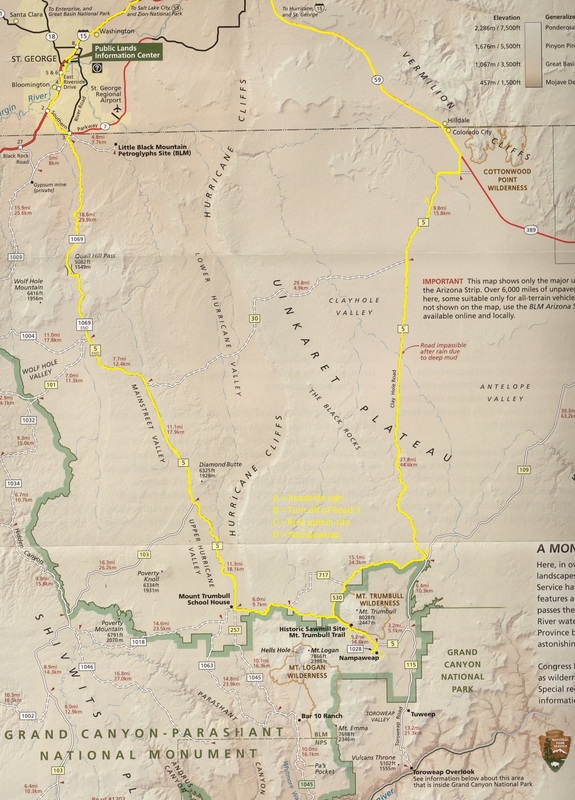 cultural, and historic resources on public lands managed by the Bureau of Land Management. on Silver Reef business owners. Come enjoy this delightful living history event. Admission: $7.00 per person with reservation and $9.00 walk up. Lecture: "Guns of the Wild West 1870's Shoot Out Reenactment"
also protects the cities' scenic red rock backdrop and an increasingly popular area for recreation. Panel Discussion: "How History Shapes Today"
A panel of experts will discuss "How History Shapes Today". made to prevent further damage to the site and enhance visitors' experience. The speaker will be Prof. Anton Bringhurst, a retired Utah State University professor living in Toquerville. with you and arrive a few minutes early. At the Legacy Clubhouse, northwest corner of Sir Monte Drive and Legacy Drive. "Discovering Treasured Landscape Paintings in National Park Service Collections". smart growth principals that enable conservation, for the benefit of present and future generations. such as the old Social Hall, Deseret Telegraph, Washington churches of 1877 and 1909, and a few more. To watch a video of this lecture, click here. and the afternoon hike will be in the White Reef Trailhead area. For more information and to register, click here or call (435)216-2651.
red rock descending into canyon walls below, lined with juniper, pinyon, yuccas, sage and cliffrose. For a report on this trip, click here and for the trip maps, click here and click here. Natural Resources (DNR), and State of Utah School and Institutional Trust Lands Administration (SITLA). that will benefit future generations. during this time, and why dinosaurs become so successful while other animal groups died out. Meet in Room 128 on the ground floor of the Snow Building on the Dixie State University Campus. Everyone is welcome. For more information, click here. Southwest Utah continues to become more and more popular as an off-road vehicle destination. both in Utah and on the Arizona Strip. Sherri Anderson will be speaking on "Christmas in Dixie". respect for those who came before us and those who will visit after us. have not been heard for 150 years. Fun takes precedence over aural (of the ear) sensuousness!